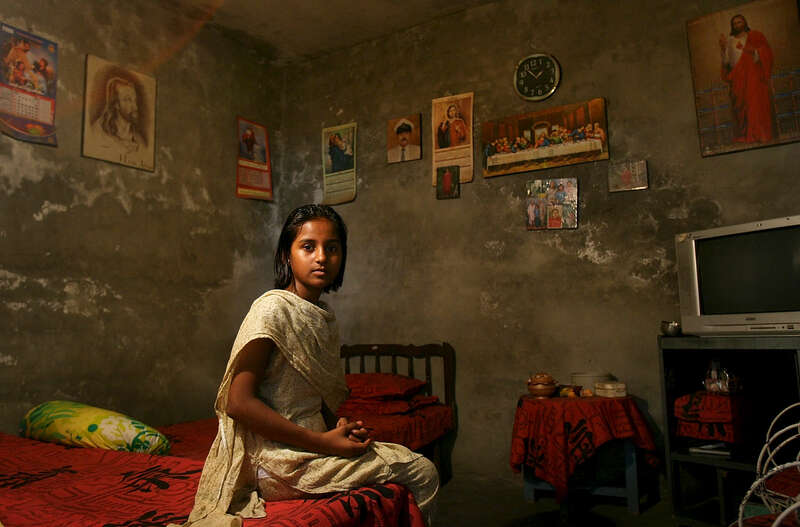 PROJECTS - DO NOT DELETE - SEE PAULA NELSON BEFORE RUNNING PHOTO - 8/26/2006 - This is a portrait of Nida Youssaf, cq, 12, in her room in Sheikhupura, Pakistan. She has religious pictures on her wall, she says, "because I love Jesus." The Christians of Pakistan are generally very poor. These are photographs from the mixed Christian/Muslim community outside of Lahore, Pakistan called Sheikhupura. on August 26, 2006. "USAID funded faith-based aid abroad" - Pakistan - Dina Rudick/Globe Staff. Story by Susan Milligan/Globe Staff.